“BACK OFF PAL,” my voice reverted to a guttural West of Scotland accent as thick as a treacle scone as I did what everyone advised me not to do. I lost my temper. 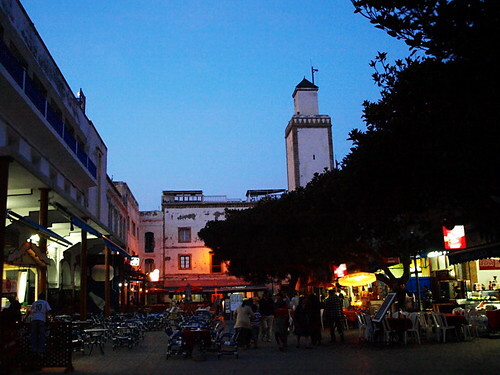 It was dark, I was tired and a swarm of touts had engulfed us as soon as the bus door had hissed open in Essaouira. I shouldn’t have shouted at the man… but grabbing someone from behind in the darkness is rather stupid. As it happened he did actually back off and we were left alone. Trouble was as we hadn’t a clue where we were or where Dar Al Bahar was in relation to our current position, we did actually want the services of a taxi. 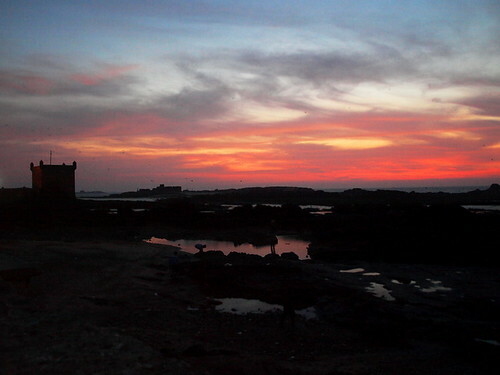 Tip 1 that I wish we’d known before we arrived in Essaouira. The bus station isn’t far from the entrance to the Medina. 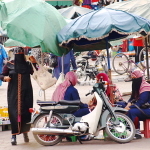 After an over priced journey of a couple of hundred yards (rookie error) our taxi pulled up at Essaouira’s main square and the driver gestured that we should get out. Tip 2 that I wish we’d known before we arrived in Essaouira. The square is as far as taxis can go. They can’t enter the Medina at all. In Marrakech we would have had no chance. 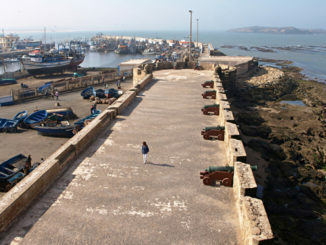 But in Essaouira I had one vital piece of information that gave us a glimmer of hope of actually finding the dar in the Medina’s maze of streets; it was built into the town’s sea-facing ramparts. Easy. Stick like limpets to the fortress walls and we had to stumble across it at some point. It was 10pm, we were hungry and wanted to get booked in and get out to eat as quickly as we could. 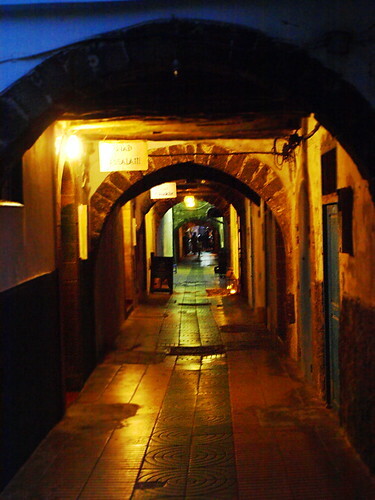 I picked the first dark alley leading into the Medina and set off at a pace. Marrakech had taught us that there was no point looking for street (alley) signs, so we simply followed the fortress wall past restaurants and bars and bright lanterns and down decently lit tunnels…until both the restaurants and lights petered out and the path ahead was plunged into darkness. Arriving in a strange town and walking blindly into a pitch black alley isn’t my idea of a sensible plan, but I figured the Dar had to be somewhere in the vicinity. I took a step into the unknown. Yes – it was that dark. After about 50 yards, and without being mugged, I could make out a faint light ahead and called for Andy to follow. From then on we had the benefit of dim lighting, but the alley veered away from the sea wall, suggesting we might have gone wrong. We were too deep into the Medina to turn back and apart from a couple of cats pigging out on fish heads, there was no other life around us. With no back-up plan we continued to forge ahead, turning left at every corner based on the premise that left would eventually take us back to the sea. In truth I had no idea where we were. Sometimes though, my internal navigational system manages to pull the rabbit out of the hat – don’t ask me how. Turning down yet another nameless alley we looked up to see sweet treasure ahead – a hand painted sign with the most welcome words ‘Residence Dar Al Bahar’ scrawled across it. Eureka. 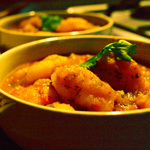 Tip 3 that I wish we’d known before we arrived in Essaouira. Sort out exactly where your accommodation is and how you’re going to find it before arriving. 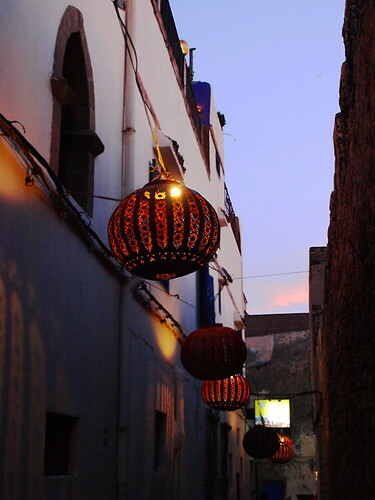 On the other hand, exploring those dark and gloomy alleys in Essaouira with no clue about where we were heading was kind of an exciting way to arrive in town. Of course if we hadn’t found the dar I might have a different view on that.